112 Sarah's Gingerbread. 5 cups flour 2 cups molasses 1/2 cup butter 1/2 cup hot water 1 teaspoon soda 1 ditto ginger. Melt the butter with the hot water. Mrs. Elwells gingerbread. 1 cup milk 2 cups sugar 3 cups flour 4 eggs 2 teaspoon cream tartar 1 ditto soda. Butter size of half an egg. Lemon flavor. Cocoanut Cake. Mrs. Rice. 2 cups sugar 1 cup butter 1 cup milk 4 cups flour 1 teaspoon soda 2 tea spoons cream tartar whites of 7 eggs 1 cup of cocoanut put into the flour. 1 cup cocoanut & whites of 3 eggs beaten stiff together for the frosting -- put on the cake when a little warm. Sponge Cake. Mrs. Hodges. No. 6. 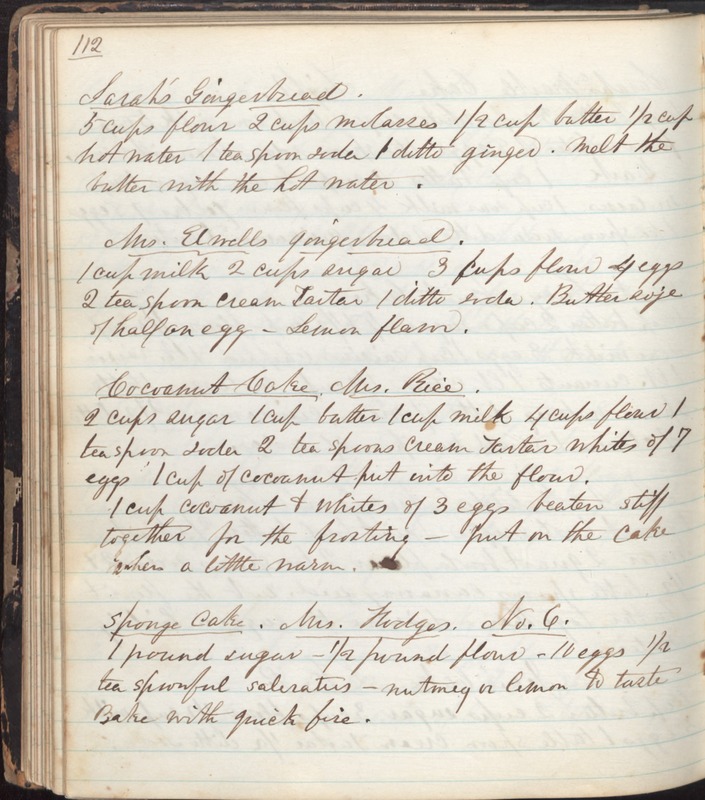 1 pound sugar -- 1/2 pound flour -- 10 eggs 1/2 tea spoonful saleratus -- nutmeg or lemon to taste Bake with quick fire.